The ink master on his most memorable sessions, his dream job in Las Vegas and celebrity client Miley Cyrus. Chris Garcia tattoos Greg Villaver, Slapshock’s sound engineer, in Manila. Photo taken by Warren Espejo. 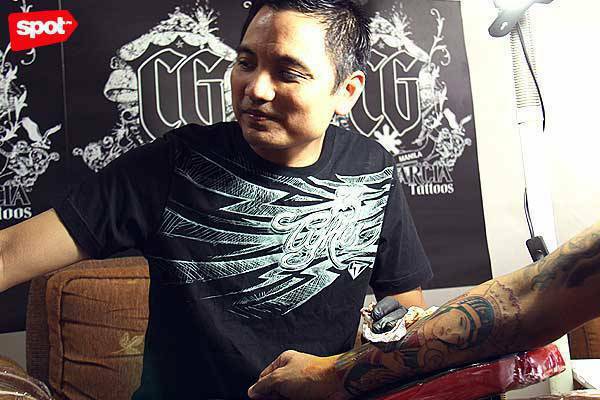 Chris Garcia is a renowned Filipino tattoo artist who can no longer get inked. Not because the Vegas-based artist has run out of bare skin to decorate, but because his heart condition makes it complicated for him to get more tattoos. Sure, technically, he can still paint himself with his signature realistic tats, or tattoos (think portraits and the like). However, the process can be "catastrophic" to his heart. The husband and father of one says, "To avoid the risks, I just stopped getting tattoos." Still, he continues the craft he taught himself almost 16 years ago. He already had his first tattoo, "a skeleton figure ripping out of (his) skin," when he and his family moved to Virginia in the United States in 1993. In Virginia, he was his own guinea pig before moving on to his family and friends, who were "very happy" to let him work his magic on them for free. The Yorktown shop Ancient Art later hired him at once, when he presented his portfolio to them. In 2005, he joined the Ink Gallery in Virginia Beach. After a few years, he moved to the swanky Club Tattoo in Planet Hollywood Resort and Casino, Las Vegas. He says he has always been artistic, but he definitely has a knack for the sciences as well. An Engineering graduate, he spent about five years working on his doctorate through a grant from the National Aeronautics and Space Administration (NASA) at the Old Dominion University in Norfolk, Virginia. However, International Tattoo Art wrote that as Garcia "approached the end of his degree program, he found that he values what tattoos offer him artistically and financially, more than (what engineering does)." When he was offered a permanent position at Club Tattoo, he "quickly accepted it," according to the magazine. Now doing well in Vegas, he has even inked some celebrity clients like tween queen Miley Cyrus and her dad Billy Ray, her mom Tish and her brother Trace of the band Metro Station. He has also marked Ultimate Fighting Championship fighter Brandon Vera and all the members of Boys Like Girls. Locally, he has worked on Slapshock, including his brother and band vocalist Jamir, Raimund Marasigan, Karl Roy and Don Allado. Garcia went back to his homeland a little over a week ago and SPOT.ph got to chat with him exclusively. Read on as he talks about 17-year-old Miley Cyrus’ controversial tattoos, an elderly client’s eyebrow-raising tat on a racy body part, and more. Chris Garcia with Miley Cyrus. The Disney star was only 17 when she got this tattoo but her mom Tish signed a consent form, according to Garcia. Click for more photos, all courtesy of Garcia. I got my first tattoo in the Philippines in 1992. The first tattoo that I did was on myself in 1994. I have one on each arm and a few small ones on my leg. I have very few tattoos compared to most tattoo artists (because of my heart condition). I have an artificial valve I had a heart surgery about 10 years ago because my valve wasn’t functioning properly. It was something I had since I was really young. Because of (the surgery), anything I do, I have to be pre-medicated. Every time I go to the dentist, I have to get a prescription for antibiotics. I just have a high risk for infection and it can be catastrophic to my heart. To avoid the risks, I just stopped getting tattoos. My mother’s name, Teresita, right here (points to his arm). My brothers and I have tribute tattoos for our mom who passed away when we were young. Jamir (vocalist of Slapshock) has a tribute tattoo similar to mine. Two of my brothers have a portrait of our mom. I did all their tattoos. If you could have other artists do tattoos on you, whom would you pick? There are a lot of good artists especially in the States but to name a couple, there’s Mike DeVries and Nikko Hurtado. They both do colored portraits. Here in the Philippines, one of the best artists, for me, is Raquel Natividad from Laguna. How did you learn the art of tattooing? I pretty much just learned on my own. I’ve always been artistic. I’ve always been good at drawing and anything that involves art. As far as that’s concerned, I had an advantage so all I had to learn was how to get comfortable with the machine and the skin. It’s kind of a trial and error process. There were no tattoo shops near our home in Virginia so I had to learn on my own. People usually learn by apprenticing with an artist. Have you had an apprentice? Not yet. Even if I’ve been tattooing for almost 16 years, I still think that I’m in the learning process. I learn something new every day. So I don’t feel confident; I just don’t think that I’ll be a really good teacher. What if your son wants to learn from you? I don’t see why that would be a problem. Learning it from me would be the right way of doing it rather than going to somebody else. But as far as him going into tattooing, that’s fine with me if that’s what he wants. But I won’t force him (into learning it), if he doesn’t want to. We read that you used to work for the National Aeronautics and Space Administration (NASA) as an electrical engineer. How did that come about? When I was still in the Philippines, I started taking up Engineering at the University of the Philippines Diliman. When my family and I went to the States, I continued my studies. I got an engineering degree and then I went for a graduate study degree. I got my master’s degree and then I was working on my Ph.D. I received the Graduate Student Researchers Program grant from NASA to do my doctorate at the Old Dominion University in Norfolk, Virginia. It’s a very competitive grant. In the university I went to, only one to three people get accepted each year. I was lucky to be one of them. I had to pretty much work for NASA. I did my research work for my doctorate over there. You’ve inked Miley Cyrus and her famous family: dad Billy Ray, brother Trace and mom Tish. How did your relationship with the Cyrus family start? Miley’s half-brother, Trace, is in a band called Metro Station. Their drummer, Anthony Improgo, is Filipino. When (Anthony) got a tattoo by me, Trace also became interested. I did a lot of tattoos on Trace, and we became good friends because we see each other all the time. We kind of hang out a lot while I’m tattooing him. Miley says she has always admired Trace’s tattoos. She always told her brother that whenever she’s ready for her first one, she’s going to make sure that I do it. During her tour last year, (her camp) had me fly out to Miami to do her first tattoo. Because she was only 17 at the time, her mom talked to me and I had her mom sign a consent form. (She asked for) a tattoo near her heart that said "Just Breathe." After that, she had me tattoo the word "Love" on her ear. We had that tattoo session at their house in Los Angeles. Why did Miley pick the words "Just Breathe"? During one of her charity events, she met and became close to a young girl diagnosed with cystic fibrosis. It has something to do with having a hard time to breathe. The girl died and the tattoo is Miley’s tribute to her. What do you think of each of the Cyrus family members? Billy Ray Cyrus is my favorite because he’s extremely nice. He’s one of the most genuinely nice people that I’ve met in the business. Whenever I visit them, he makes sure that I’m doing okay. He even calls me "brother." A lot of people say Miley’s mom is suplada (a snob) because she’s Miley’s manager, but she’s also very nice to me. She always makes sure I’m taken care of. Miley is a typical teenager. Okay siya, kalog siya (She’s wacky). For somebody who grew up well off, she’s very courteous. Her brother Trace has the rock star attitude. He has the most tattoos in their family. What tattoos did you put on each of them? Trace is only 22 but he has sleeves on both arms, tattoos on his neck and upper body. He’s the most addicted to tattoos in the family. I did angel wings on Tish’s back, some writing on her shoulder, big flowers on her lower abdomen and a couple of smaller tattoos. I did a portrait of Geronimo, the Indian chief, on Billy Ray’s arm. I also did the sleeve on his arm. The whole family loves tattoos so I won’t be surprised if Miley goes crazy with tattoos as soon as she turns 18 in November. The last time I was at their house was (on September 9, Philippine time) just before I came here. I spent the night there, working on the mother and Trace. Miley was there, hanging out the whole time. I think she has reached her tattoo limit as far as her mom’s concerned. Miley is just waiting to turn 18. Among the celebrities you’ve worked on, which ones are the most memorable? Miley is the most memorable, of course, because she’s at the peak of her career. She’s probably the biggest celebrity that I’ve tattooed. Jamir, my brother, is the living proof of the development of my career. You can see the progression of my work all the way back from the time I was just starting out (about 16 years ago). I had a client who was around 60 or 70 years old. She got a tattoo of a unicorn on her right there (points to private part) and right below the unicorn was the word "horny." I was scared to ask why she wanted that tattoo. There’s also a guy, around 20 years old, who asked for a potato tattoo. Just a potato with konting lupa-lupa (bits of soil). Here’s the story behind it: Before his mom went insane, she read to him every night. That’s his fondest memory of her. In the book that she read to him, the main character got a tattoo of a potato. Manny Pacquiao. I’ve met him a few times but I haven’t tattooed him yet because every time we meet, he’s training for a fight. But I have done a lot of work on some members of Team Pacquiao. Manny is actually the one who paid for their tattoos. Every time I go to them in Los Angeles--I think it has been three times--I stay at the infamous Team Pacquiao apartment, the one that’s always featured on HBO. Have you ever refused to tattoo anyone? Yeah, if it’s a racist design or anything that’s anti-religion. Describe your longest tattoo session. When I did Jamir’s back tattoo, one of our sessions lasted for almost 11 hours. He was awake the entire time, just listening to music. I use the Swashdrive machine, which is more lightweight and smaller than what most tattoo artists use. I use the standard inks and needles, which other artists use as well. What should people know before they come to you? Ideally, they should already know what they want even if they don’t have an image because I can come up with that or we can look up stuff online. It’s good but not necessary that they are familiar with my style. Chris Garcia works on Greg Villaver, Slapshock’s sound engineer. Photo by Warren Espejo. How should a client prepare for a tattoo session? Two main things: Have a good night’s sleep and make sure you have something in your stomach. You don’t have to be really full; just don’t come to the session hungry. If you do, there’s a higher chance that you’ll pass out. How much do you usually charge? In Vegas, it’s usually around $250 to $500. That’s for average-sized tattoos that normally take me an hour to two hours (to finish). The bigger ones that take almost a whole day to do cost about $1,000 to $2,000. It’s more expensive there because it’s a tourist destination and the shop is inside one of the casinos. In the Philippines, it depends on what you’re getting and how long it takes but I normally charge around P4,000 an hour. What are some of the awards you’ve won? In the 2008 Richmond Tattoo Convention, I won Best Black and Grey, Best Small Color and second place in Most Realistic. What do you think of the tattoo industry in the Philippines? Right now, I think it’s doing really well because more and more artists are coming up that do really good work and can compare to the artists in the States. Pagaling ng pagaling. Plus, they can get the same equipment we use in the States. 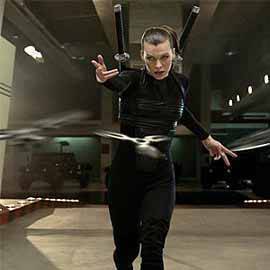 Clients are becoming more diverse, unlike before when only bikers got tattoos. Because of TV shows on tattoos, people see that it’s not just for bikers. Everybody’s getting inked. What are your must-eats whenever you visit Manila? My favorites are the fast food joints here like Jollibee and Chowking. I make sure that I eat street food: fish ball, isaw and ihaw-ihaw. What advice can you give to aspiring tattoo artists? Polish your drawing skills. Build a good portfolio of your work so you can show it to a tattoo artist you want to apprentice with. I don’t advice learning on your own, like what I did. It’s funny that you asked that because two weeks ago, the owner of the Vegas shop asked me the same thing while I was tattooing him. I didn’t know what to say which is surprising to me because I usually have a five-year plan. Then I realized that working at that shop was my five-year plan a year ago. I’ve actually achieved my five-year plan. I’ve always wanted to work in a shop that’s kind of high profile, busy and doing pretty good financially. And I get to do the tattoos that I like to do. In five years, I want to see myself doing more of the tattoos that I really like to do. I want to have more people from different places come to get a tattoo by me. Have you ever thought of opening your own shop? People have always asked me why I haven’t done that. I’ve been in the industry for 15 years and I see how hard it is. Maraming hassle to open a shop. (You have to go through a lot to open a shop.) I’m afraid that if I open a shop, it’s going to take away from the art. I’m not going to be able to focus on the art because I have to think of the business side of things. I really don’t want that to happen. Catch Chris Garcia in a live tattoo session at Hard Rock Cafe in Glorietta 3, Makati City on September 22, 2 p.m. The event also features an unplugged performance of Slapshock. On September 21 and 23, see him in the Chris Garcia x Team Manila Tattoo Sessions at the Manila Remix Store in The Collective, Makati City. Garcia will also be at the Dutdutan 2010 on September 24 and 25 at the World Trade Center in Pasay City. To book an appointment with Garcia (though you’ll have to wait until his next trip to Manila, unless a client cancels his or her session this month), email him at chrisgarciatattoos@gmail.com. Photos courtesy of Chris Garcia. Additional photos by Warren Espejo.